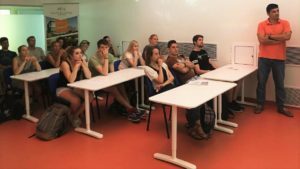 Ingenia Solar Energy, ISE, has been chosen by the Technology Park of Almeria, one of the leading companies in the park to give a lecture and present students of the RWTH Aachen University works and projects that ISE is making today. Francisco Javier Fernandez del Pino as manager of ISE and the engineers Lorenzo Gutierrez and Francisco Quirantes have shown the students of this German university, the internationalization of Gransolar Group (GRS) and the size of projects and developments ISE perform. Students showed great interest during the talk and interacted with queries and questions throughout the exhibition.